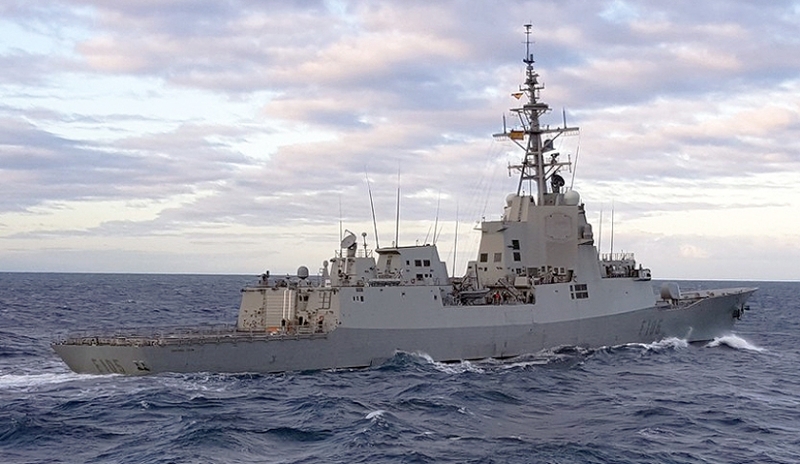 Spanish Armada ship F-105 ESPS Cristóbal Colón has departed the Ferrol naval station, complete with a detachment of five Royal Australian Navy (RAN) personnel. The ship is bound for Fleet Base West in Rockingham, Western Australia, and is expected to arrive in mid-February, staying in Australia for the following four months. Chief Petty Officer Marine Technician Shane Smith is among the detachment on the Cristóbal Colón and said the Spanish frigate has an almost identical layout to, and shares systems with, the air warfare destroyer. Lieutenant Commander Ben Wellfare, who is leading the Australian detachment, said the Australian personnel are putting the transit time to good use. During their four-month stay, 185 Armada personnel will call Australia home. Spanish Leading Seaman Cesar Carralero said while he will be a long way from family and friends, he is excited to visit Australia. Australian Defence Attaché to Southern Europe, Captain Ray Leggatt, and the Commander of the Naval Action Group One, Rear Admiral Spanish Armada, Alfonso Perez de Nandares, farewelled the frigate under the command of Commander Ignacio Cuartero Lorenzo.